Samsung Galaxy S8 vs OnePlus 6T | Beauty Vs Beast. 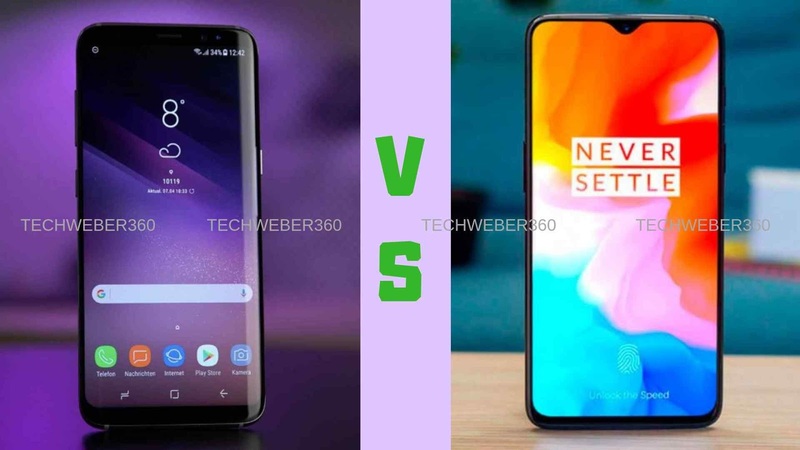 HomeSamsung S8 vs Onplus 6tSamsung Galaxy S8 vs OnePlus 6T | Beauty Vs Beast. Last Two Years is The Years of New Smartphones Concepts Such As in 2017 Samsung Launch The Most Beautiful and Premium Looking Smartphone, The Galaxy S8 And S8 Plus Which is Bigger Than Normal S8, The Phone Introduce The All New Infinity Display Which Looks Gorgeous And Also in 2018, Nobody Beats The looks And Display Which is Super Amoled And Almost Comes With 3K Resolution Gives Extra Pleasure To Your Eye When You Watch Movies And Play HD Games. In 2018 The Chinese Giant Launch The Most Powerfull Smartphone in Current Time The Successor Of 6 Month Oneplus 6 Are Launch With an Extra T, The OnePlus 6T Which Has The Revolutionary In Display Fingerprint Scanner Which Now Days Comes Only in Few Phones Such as Vivo V11 Pro Or Huawei Porshe Edition, The Phone Looks Like It Preccedor But The FingerPrints Position Was Changed From Back To In Display. So, Today We Gonna Compare This Two Giant Flagships Smartphones of its Years and Identify The Upgrade in This Year Smartphones, or if You Have a one year old Samsung Galaxy S8 Should you Upgrade it or Not So Lets Find Out. Design was most important section if you love premium looking smartphone, both smartphones looks very good in design but the S8 which comes With Infinity display looks more cool and gorgous also in 2018, Front and Back Of S8 are made and Cover with Glass with the Protection Of Gorilla Glass 5 Which makes this smartphone premium, the OnePlus 6T is Also looks good with a water Drop Notch and Glass Back. When its Comes to Display Both Smartphone Perform very well according different advantages, The OnePlus Comes with Big 6.4 Inches with the Aspect Ratio of 19.5.9 which increase a bit height of screen, the screen is very big but the resolution which is 1080*2340 are slightly lower than the S8. the S8 Featured a 5.8 Inches Super Amoled Screen with the pixel count of 570 per Inch Which is Something amazing and the resolution of S9 is 1440*2960 . Both device comes with Gorilla Glass 5 Protection The S8 Covered with both side but the OnePlus 6T only protect from front side. OnePlus 6T featured the Dual Camera Setup the primary Camera is 20 MP (1.7/f 1-micron) and the secondary Camera is 16 MP for Portrait mode and Blur Effect with dual led Flash. Front Camera is 20 MP (2.0/f 1-micron). On other hand the S8 Featured the single 12 MP Camera with the Aperture of 1.7/F which is identical to OnePlus 6T but in real life S8 Takes better images than The Oneplus 6T. but according to the specification OnePlus beat the the Giant. Samsung powered the 835 Snapdragon Processor for USA and Europe with 4 GB of Ram, but in India you will get the Exynos 8895 Chipset is more powerfull than the snapdragon 835, both processor are Octa Core Processor. On other hand the OnePlus 6T comes with the latest flagship chipset, The SnapDragon 845 which was the Upgraded Version of last year Flagship 835. Oneplus comes in 2 variant 6GB/64GB Storage, 6GB/126 GB Storage. 256 GB variant are also available in the new Oneplus 6T, No Doubt that the OnePlus is The Beast When it comes to the Processor. but both devices are very fast and Flagships so you dint need to worry about the performance. OnePlus 6T Comes with the Latest Android 9.0 Pie Operating System with Oxygen Os which is identical to Stock Android with Some Advance Customization which is very Fast. Samsung Galaxy S8 Run On Android 8.0 Oreo Operating System, they also gets the android pie update in upcoming time. Both Device are 4G Ready with all mandotary Sensors but there was a speciality in OnePlus 6T, in OnePlus 6T you can use both 4G Sims at same time because its Supports Dual Volte but in samsung you can only use one 4g Networks at one time. Samsung has 3 ways to protect and unlockinh your device such as Fingerprint Sensor, Facelock and the best they also have Iris Scanner which is very Secure in campare to facelock and fingerprint scanners. Oneplus 6T was a revolutionary In Display FingerPrint Scanner which Looks Quit Awesome But Slow when we Campared to the virtual FingerPrint, it also have the face lock which is very fast in campared to S8. Both Devices are Flagships and Made for different types of People if You Want a Future Proof Phone than i Suggest you to Go for the OnePlus 6T, But if you want a phone for 1 or 2 Years which Has a Super Amoled Screen and the Gorgeous looks with the support of Samsung Then I suggest Samsung S8.